Kelly’s talk centered on Lenfilm, the “little brother” to Mosfilm, and the second-largest film studio in the Soviet Union. “I’ve got interconnecting purposes in the project, and one of them is studio history and the hand-writing – the brand – of films that come out of a specific workplace,” she began. Lenfilm is “roughly half the size of Mosfilm, but probably less than half as prestigious,” she said. The latter, which worked closely with the Soviet censorship authorities and had a cinematographer’s union, was able to produce 35 to 40 films a year, in contrast to the Leningrad studio, whose limited budget and resources could only manufacture 15 to 16 features. 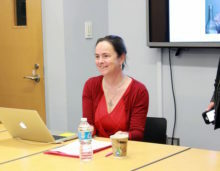 Kelly noted that the project seeks to link together her interest in the production mechanisms of the film industry and the final cinematic product “because so often, as I’ve argued [in my paper], they are treated separately.” To do so, the historian juxtaposed the image Lenfilm projected to the world and the hectic process of producing a likely underfunded, resource-bereft film. Kelly also spoke about the role of young directors in Lenfilm, including Vitaly Melnikov and Viktor Tregubovich, and the concept of emotional cinema in the Soviet Union. “Deciding how to debate realism is unsatisfactory in the sense that there’s not that much high-level theoretical discussion going on,” she said. During the Brezhnev era, there was no theory of realism as in the contemporaneous Polish cinema. Still, Kelly said, “what there does seem to be a lot of is an interest in emotions.” She cited the 1973 film The Monologue, in which both the male protagonist and his granddaughter act in remarkably emotional roles. The subplot of the film, Kelly added, revolves around a scientific investigation of emotion. Finally, Kelly said, her paper is concerned with the role of alcohol in creative terms – as a form of self-expression and an excuse for nostalgie de la boue – and in terms of alcohol consumption in the underground. “I argue against a medicalized view of alcohol consumption as necessarily alcoholism or clinical, but also as a form of social practice, as a social facilitator and a creatively enabling fact,” she said. In the Q&A session that followed, Kelly was able to expand on the particularities of Lenfilm during the Brezhnev Era. “Lenfilm had a strong sense of artistic purpose and specialized in documentary studio and literary film,” she said, which curbed audience numbers for the studio’s productions. Instead of incorporating ideological messages within their films, “people were using ideological language to get their art through the process of filtration,” she added. “Their language is constrained by the discourses available to them.” Based on Lenfilm’s unique position within the film industry, Kelly said that those who worked for the studio were proud of their corporate identity. Further comments brought up topics that Kelly may or may not want to include in her forthcoming book. Director of the Jordan Center Yanni Kotsonis brought up two tensions: the anti-alcohol campaign and masculinity. “I think it’s impossible to talk about alcohol in Russia without gendered terms,” Kelly said, agreeing that gender should play a role in her project. Bruce Grant, Professor of Anthropology at NYU suggested incorporating a Foucauldian repressive hypothesis to explain the relationship between Gorbachev’s anti-alcohol campaigns of the 1980s and the appearance of alcohol in Soviet cinema. Subsequently, Associate Professor of Russian and Slavic Studies at NYU Anne Lounsbery asked Kelly to lay out the basic forms of drinking as seen in films. “What’s important here is not the act of drinking, but how it’s done,” Kelly said. Most of the time, however, films show drinking in the company of others in the form of a celebration, rather than an actor drinking alone. Finally, Eliot Borenstein, Professor of Russian and Slavic Studies at NYU, highlighted a contrast between the presence of alcohol in American films and Russian films. Whereas the colloquium underscored that Soviet films typically identify alcohol as a class problem, “American films tend to treat drinking related to an occasion or a youth problem,” Borenstein said.